You bring the party and we provide the trolley! 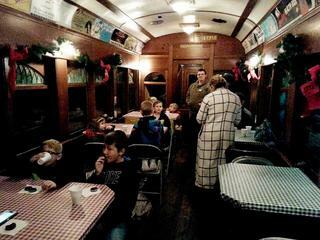 It's an authentic, 100-year old trolley car inside the museum that has tables and chairs to seat up to 36. Here's the deal. You bring the party treats, etc. and pay the regular admission for yourselves and your guests. There's no charge to use the trolley car! Admission includes a 2-mile round trip trolley ride for you and your guests, as well as the opportunity to enjoy the trolley cars, steam locomotive, fire truck, model railroad, and many exhibits throughout the museum. This offer is open Sundays only, during the museum's normal open hours. For other days and times, arrangements can be made under our group tour requirements. Contact us to schedule a date and work out the details of when you plan to invite your guests to arrive, and for which departure of the trolley ride you want tickets reserved. Contact Us via email., or leave a message at (585) 533-1113.